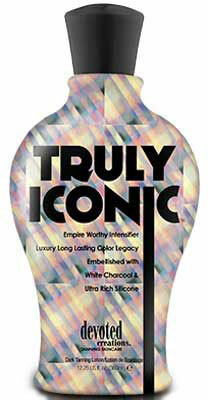 Devoted Creations Truly Iconic Tan Enhancer Intensifier - 12.25 oz. They say to dress how you want to be addressed. With this color classic your look will go from fair to famous! This empire worthy intensifier will have you brunch-time-bronzed with no added self-tanners and standard setting, skin perfecting ingredients. Not to be petty, but know your worth... you were not made to be subtle, you were born to be Iconic! Japanese Rose - Refines pore size while boosting collagen production and reducing excess oil. Tiger Grass - Color-correcting ingredient that reduces redness and helps protect skin from enviromental stress and blemishes. C5 Technology - Silicone feel, without the silicone. Lightweight, silky-smooth skin conditioner that helps lock in skin’s moisture and tanning results. Advanced Matrixyl Synthe 6 - Powerful anti-aging peptide that reduces the appearance of fine lines and wrinkles for long lasting results. Body Fit Technology - Reduces the appearance of cellulite and restores firmness. MelaTime - Boosts Melanin production for faster, darker results. FreshTek - Proprietary blend of deodorizing and skin freshening ingredients. Save 51% Devoted Creations White 2 Black Violet Black Bronzer - 8.5 oz.